Do you offer live scoring and projections? Yes, all of our data is in real-time on game day, including box scores, player stats, and play-by-play information. Our data is faster than Yahoo! or ESPN, and you'll see statistics update from us before you see it live on TV. To make it even better, our box scores are automatically adjusted to use your league's scoring settings, so you'll never have to do the calculations on your own! 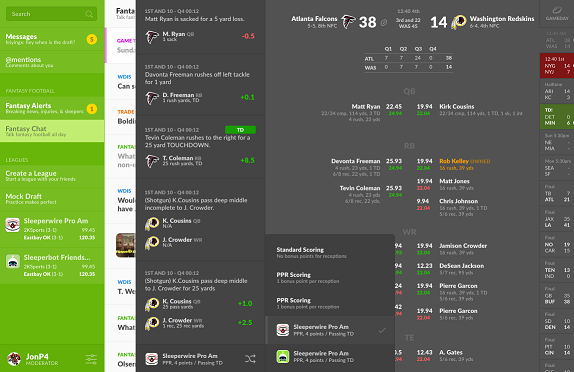 We also offer the ability to customize game-day alerts so that you are notified of big plays, scoring drives, and more! In addition, we also have 3rd-party player projections provided by FantasyData, which are updated for every single week of the season.